October | 2013 | Small Farmers. Big Change. Over the past several weeks I have been in Central America, visiting our producer partner groups. At every stop along the way, I get gems of knowledge dropped on me at totally unexpected moments. Sometimes this is as straight forward as a farmer explaining a new organic practice that I have never seen before. However, more often than not, producers shatter my worldview with their incredibly refined and pointed observations of the world in which we live. Frequently, these great moments happen when I am precariously weaving my way through a muddy farm trying my best not to fall on my face in front of 20 farmers. Needless to say, I don’t always have pen and paper handy. However, I absorb what they are saying and store it away in my brain to share with co-workers or friends at some point in the future. I am realizing how short-sighted this is! 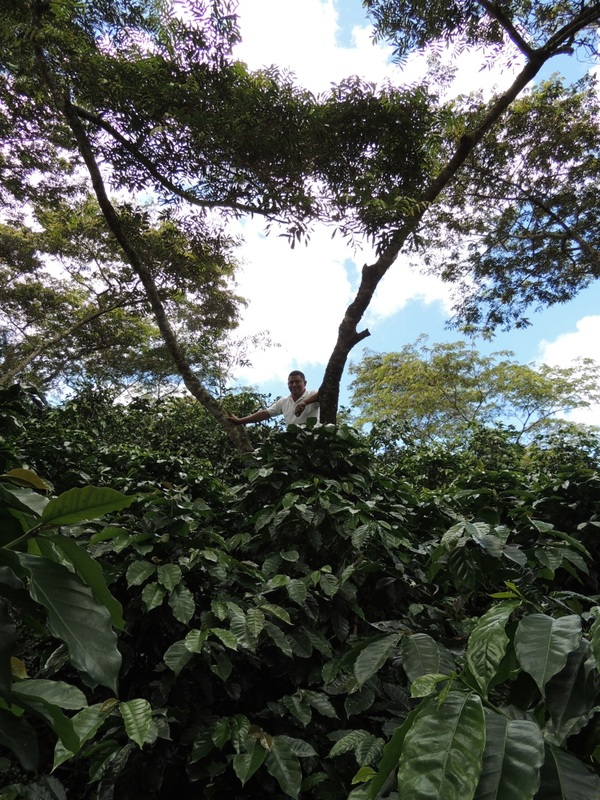 As interested as a lot of the folks who buy our coffee, chocolate and myriad other products are in how our products taste, I know that consumers are also interested in WHERE their favorite coffee comes from, WHO grows it, and WHY do they do what they do. So, please read on to experience some of my favorite “whoa, knowledge was just dropped!” moments of the past month. “It’s not sufficient to say that poverty is the problem. We must say that the system that generates and maintains poverty is the problem,” Miguel Mateo tells me. He is referring to the importance of creating new institutions that change the entire system of traditional trade and why he views the relationship between Manos Campesinas and Equal Exchange as a game changer. Miguel Mateo, Sales Manager, Manos Campesinas Co-op, Guatemala. 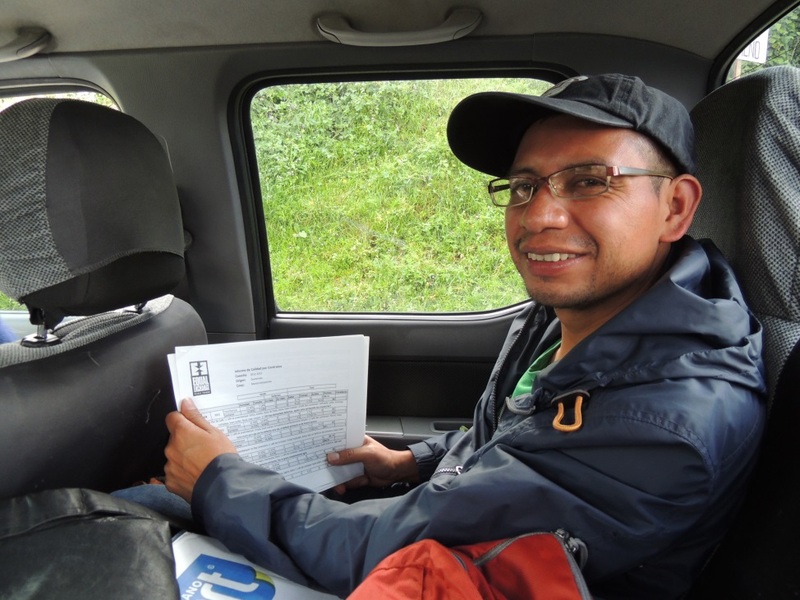 Here he is discussing last year’s quality results in our “on the go” office in Quetzltenango, Guatemala. “That’s why it’s called a Cooperative. We don’t just cooperate with members, we cooperate with everyone,” says Clemente Moreno Carrazo, president of one of the primary cooperatives of Prodecoop in Estelí, Nicaragua. At Equal Exchange, we talk a lot about cooperatives and what it means to be a cooperator. Hearing this from Clemente made me aware that the supply chain that we are a part of—growers’ cooperative à worker cooperative à consumer cooperatives/cooperators—does not stay within our cooperatives. The primary level co-op of which he is the president actively invests in their community members whether or not they are members of the cooperative. They rebuild bridges, improve the roads for better commercial access, support the community school band, provide transport for medical screenings to community members, and provide school supplies for the children in elementary school. I think this was a pretty great moment for me to consider what our cooperative does to invest in our community and again, producers setting an example for us. Cooperation reaches the furthest when you start collaborating with everyone. 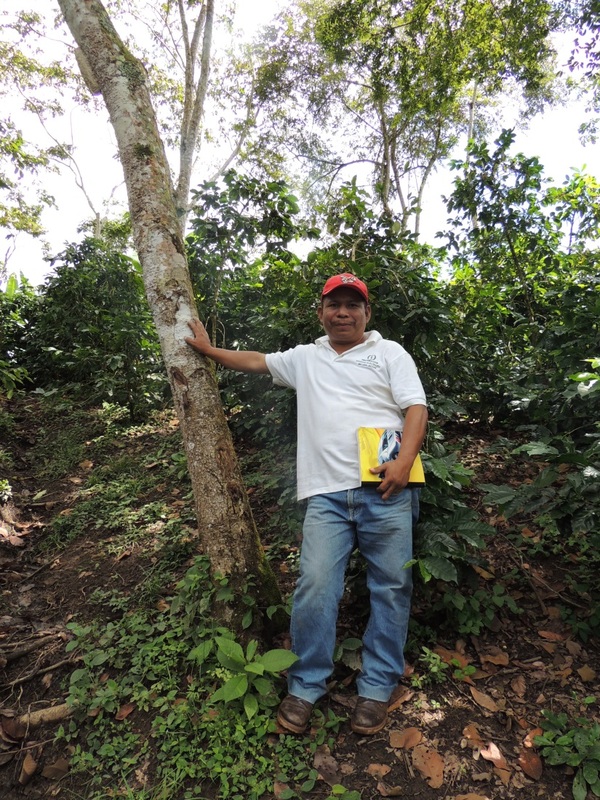 Clemente showing off his wife’s farm in Samarcanda, Madriz, Nicaragua. “Which Bicycle?” refers to the name that Omar Oscar Alonso gave to his coffee farm several years ago when he reached a difficult crossroads in his life. He retold the story of this challenging time for me and the idea that eventually encouraged him to move forward (not backward) to become one of the most innovative members of COMSA in Marcala, La Paz, Honduras. Several years ago, during this challenging time in his life, Omar realized that the bicycle was the perfect metaphor for his life. Bicycles only move forward and in order to ride a bike successfully, you have to find a balance and continue to maintain this balance as you move forward. He decided to name his farm “Which Bicycle?” to continually remind himself that he was moving forward and to focus on the balance that farming requires. In addition to being a philosopher, Omar is also an innovator. While visiting the Which Bicycle? farm, he demonstrated to me one of the coolest and most original techniques for water retention on a farm that I have ever seen. He had a friend who started selling fresh coconut water to the local market. The friend had accumulated hundreds of coconut shells/husks and was preparing to throw them away but Omar did not want to see that much organic material wasted so he agreed to buy the coconut shells for a small amount of money. He had no idea how he was going to use them but he brought back a big truckload to his farm and started to think of how to use them. Eventually, after studying the properties of the coconuts, he realized how much water the husk contained even after the coconut water had been removed. 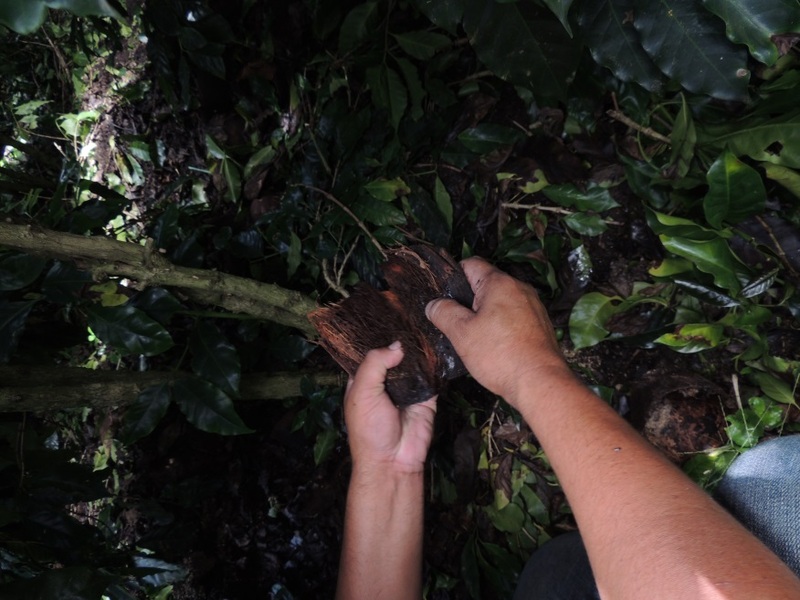 Omar started placing several open husks around the trunk of each of his coffee plants with the thought that the water contained in each husk would be absorbed by the coffee plant and soil during the summer (dry) season. To his great surprise and pleasure, his idea worked! He leaves the husks in the underbrush of the coffee farm and eventually, they decompose and return organic material back into the soil. These moments that I have been able to share here are only a tiny sliver of the things that I get to see and hear while visiting farms and producer groups. I hope that these moments encourage you to stop and think more deeply about the issues that we are dealing with in this world of alternative trade. I am continually amazed at how much I learn on a daily basis while doing my job and I will be satisfied if I can pass along even a fraction of the eloquence and determination that our producer partners share with us. Last week, we hosted two managers from cacao co-ops we work with in Peru to source chocolate for our new Organic Chocolate Chips and for our line of Organic Candy Bars. Hildebrando Cárdenas Salazar from Oro Verde co-op and David Contreras from ACOPAGRO co-op visited our headquarters in Massachusetts to learn more about Equal Exchange, meet some of our store accounts, and work on 2014 planning for our USAID grant project with the two co-ops. Read more here. Ten years ago, Equal Exchange brought a group of food co-op and natural food store representatives to visit CEPICAFE, one of our small farmer coffee co-op partners in northern Peru. We stayed four days and nights living and working along side the coffee farmers, “helping” them with the harvest. One of my most fond memories was during lunch following that first full morning (ie 4 hours) picking coffee. We had had a lot of fun, laughing, singing, and telling jokes with the farmers, while they tried to teach us their techniques. But truth be told, the work is back-breaking, the hike to the farms was exhausting, and the sun was hot. We’d told the group of 12 that after lunch we’d be joining the farmers for another 4 hours of cherry picking. One by one, the visitors approached me to whisper in my ear, “I really don’t think I can do any more.” So when we were done with our heaping plates of rice, beans, chicken stew, and corn tortillas, I announced to our hosts that the “workers” were done. Earlier in the day, we had joked that we had come to help them “so they could have a break”, but we had to admit that we just couldn’t keep up. The farmers laughed good-naturedly as we explained the “rebellion at hand.” In the partnership of producers and consumers, it was clear who had the tougher role. I remember also when the long day was ending. We were joined at the depulper, the wet mill that takes the outer layer of the coffee pulp off the bean, by the entire co-op of perhaps 60 to 70 farmers. One by one, the visitors took their turn at the mill as each coffee farmer turned over bucket after bucket of beautiful red coffee cherries. The farmers cheered and laughed as the northerners grunted and groaned, hamming it up just slightly for the crowds. It was more hard work, turning the shaft round and round as the blade separates the pulp off the bean; and your shoulders can get pretty sore. The farmers of course have to depulp everything they’ve picked that day or the beans will over ferment and the quality will be seriously jeopardized. So, we got competitive with each other, and ended by groaning from the monotonous efforts using muscles we didn’t know we had. Our hosts gathered round cheering us on, hopefully feeling acknowledged and respected. In utter sincerity, we let them know that we would not be able to do this, as they do, day after day. After four amazing days sharing meals, stories, and the harvest in the small village of Coyona, and four star-filled nights sitting on the back porch in the dark with our hosts, just watching the silhouettes of mountains and listening to their six year old son play the guitar and sing wistful ballads for us, it was time to go. The community threw us a going away party that felt truly heart-full. We ate sheep head soup, drank beer (our contribution), bootleg moonshine (their contribution), and danced until the wee hours of the morning. I won’t forget that visit ever. Or Dona Dora when she cried at the co-op meeting where we introduced ourselves and she told us she’d never met a coffee buyer before; in all the decades she’d been growing coffee, she’d never once met someone who had drunk it or bought it, never mind that one of these people would one day end up in her village. She cried and we cried in response. We had come to learn from the producers, share some of ourselves and our lives with them, and let them know how much we appreciate the hard work they go through to give us our coffee. It’s not an exaggeration to say that friendships were made during that trip and bonds were formed despite the distance, language, and cultural differences. It’s now been ten years since made that trip. West Coast Sales Manager, Tom Hanlon-Wilde decided to host an anniversary visit this past summer. He invited the folks who’d gone with us in 2003, and a few others, to visit the community and see how things have changed since then. Were the farmers doing better? How had their lives changed? How did they feel about Equal Exchange and what impact has our on-going relationship had on them? Sadly, I wasn’t on this anniversary trip, But I’m looking forward to hearing from those who went. In the upcoming weeks, I hope to post articles, reflections, and photos from the participants. Today, I’d like to share with you the first article that was written by one of our trip participants, Joe Damiano, Bulk Buyer at the Green Star Natural Foods Market, in Ithaca, New York. Click here for the full article. Read Tom Hanlon-Wilde’s reflections here. It’s these memories, and reading new reflections, that makes Fair Trade so much more than a job, so much more than a transaction, and so much more than a cup of coffee. October is Co-op Month! A month of co-op joy. October is both Fair Trade and Co-op Month. Here is a wonderful post by Somos Estrellas about how you can learn more about co-ops, join co-ops, and support co-ops. Pour yourself a cup of Fair Trade coffee, tea or hot cocoa (from worker-owned coop Equal Exchange, of course) and look through this fun and inspiring calendar of activities! with an emphasis on U.S. worker-owned co-operatives: it’s just what I know best. Hang a poster in your work or home and share Co-op Month via social media to get the word out! Uh, what’s a co-op again? Register to watch a brand-new film about the Rochdale Pioneers. Worker-owned co-ops are a type of co-op- but what are these, now? Find worker co-ops in your area- buy from them, try to get a job, offer support if applicable, and learn more. Or look through the USFWC “Find a Worker Co-op” search. Fair Trade, like coffee, is complex, rich and fascinating. We now have available a new educational resource: The History of Authentic Fair Trade. In comic book format we present a version of Fair Trade that is shared by many Equal Exchange colleagues, allies, and partners. We hope that by presenting the material in this way, with heroes and villains, and condensed stories, it will pique the reader’s curiosity so that she will dig deeper, ask questions, and ultimately make a conscious decision about where she stands in relation to small farmers, co-operatives, and democratic movements, as well as corporations, certifying agencies, and alternative trade organizations. So sit back and enjoy a cup of coffee as you contemplate this history of Fair Trade, and decide how it all fits together on your path to peace and social justice. Click here to read an on-line version. Click here to download your copy today! Clik aqui para leerlo en espanol. Individuals can purchase a hard copy here. Stores: To order multiple copies, please call your sales representative. This month, we are making available a new educational resource, The History of Authentic Fair Trade. In comic book format, we present a version of Fair Trade that is shared by many Equal Exchange colleagues, allies, and partners. We hope that by presenting this material in this way, with heroes and villains, and condensed stories, it will serve to pique the reader’s curiosity so that she will dig deeper, ask questions, and ultimately make a conscious decision about where she stands in relation to small farmers, co-operatives, and democratic movements, as well as corporations, certifying agencies, and alternative trade organizations.